Tu erige nos, Salvator Christe. 3. Nos desideramus ardenter te sequi. quod tu desideres gemmam requirere in putredine. qui nos redemisti in cruce. edificans vitam in aurea civitate. whatever tastes of that one fruit. Set us aright, O Savior Christ! 3. We burn in our desire to follow you. the spotless King of angels. for you desire to seek again a gem in putrefaction. who has redeemed us on the Cross. within this lonely wilderness of tears. and with you ever stay? as if you’re present even now. and building life within a golden city. who dragged our primal parents into death. Verse 10: seducentis] R; seducentem, D: the accusative ending is nonsensical and likely a scribal error caused by the endings of the previous words in the line. 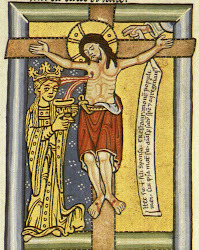 Hildegard gave this piece the unique title of Symphonia virginum, a “symphony of virgins.” Together with O Pater omnium (also called a symphonia, but for widows), and the morality play Ordo Virtutum, it represents the only non-liturgical (or perhaps para-liturgical) genre in Hildegard’s oeuvre. We do not have any direct evidence for when or where these pieces would have been performed, or for what purpose. Nevertheless, it has been reasonably conjectured that the Ordo Virtutum was premiered for the dedication of the Rupertsberg monastery on May 1, 1152, and may perhaps have been performed annually in commemoration of that event. The two symphoniae may similarly have been composed for communal performance whenever a new nun was professed into the abbey. The liturgy of profession as a vowed female monastic is filled with bridal symbolism, and so it is not surprising to find Hildegard embrace the nuptial imagery of the Song of Songs throughout this symphony. Newman has catalogued the parallels between the nuns and Solomon’s bride: “they praise their lover’s beauty and lament his absence (stanzas 7-8), extol his superiority above all others (stanza 6), bewail their own weakness (stanzas 2-3), and above all, plead for his help (stanzas 1-2, 4-5, 10)” (Symphonia, p. 305). Intertwined with this highly conventional bridal imagery, however, is a structure more peculiarly Hildegardian: convergences between her virgins and the two great virgin mediators of God’s relationship to humanity, the Virgin Mary and the Virgin Church (Ecclesia). Mary’s model virginity suffuses Hildegard’s writings about the order of the Church to which she belonged, as for example in the antiphon, O pulcre facies. 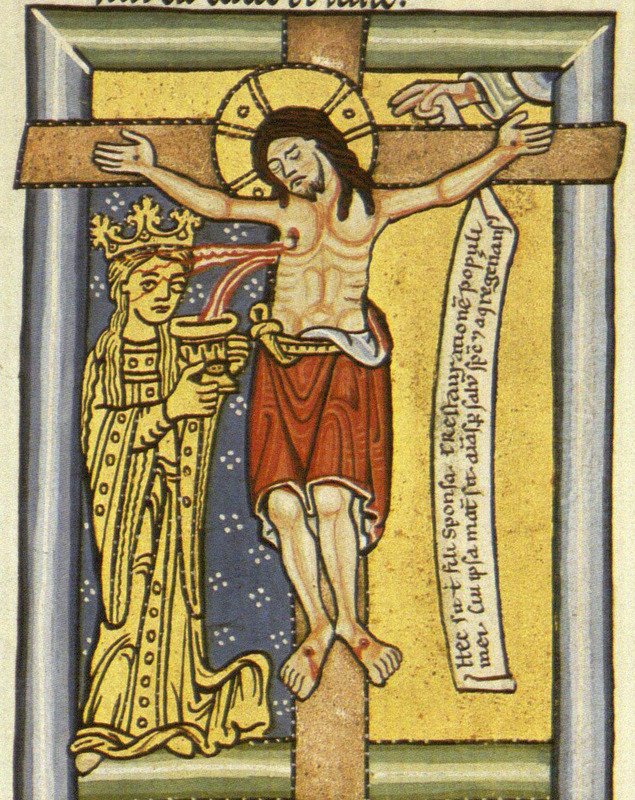 The final two verses of this symphony make this model explicit: because the Virgin is the mediator of Christ’s life-saving leap from heaven into humanity, it is in her company (societatem) that Hildegard’s virgins could follow that path in reverse, from the fallen frailty and mortal exile of “our primal parents” (first lamented in verse 2) to the “golden city” of heavenly, eternal life. Several of Hildegard’s compositions for Mary are likewise situated in that stark drama of death and redemption, with particularly strong verbal echoes between the symphony’s verse 9 and the responsories Ave Maria, O auctrix vite and O clarissima. And to His breast, that is in the wisdom of His mystery, for love of His Son He holds that poor, weak, infirm mire that is Man [homo]: black in the blackness of sins and filthy in the filthiness of the flesh, but the size of a human heart, which is the breadth of the profound wisdom with which God created Man. For He has looked upon those who are saving their souls through penitence, and no matter how in their persistent weakness they have sinned against Him, they will come to Him at last. They are surrounded by ornaments, those great ones who rise up among them: martyrs and holy virgins like precious stones, and innocent and penitent children of redemption like pearls; so that by them the mire is surpassingly adorned, and the virtues, which so gloriously shine in God, shine also in the human body. For He Who put breath and life in Man was scrutinizing Himself. How? Because He foreknew and decided in advance that His Son would be incarnate to bring redemption; therefore, every stain of sin must be washed away from His body. “Beautiful of form above the children of men” [Psalm 44:3]. This is to say: In Him shines forth beauty beyond beauty, the noblest form free from any spot of sin, without a splash of human corruption, and lacking all desire for the sinful works demanded by fleshly human weakness. None of these ever touched this Man. And the body of the Son of Man was born more purely than other people, for the stainless Virgin bore her Son in ignorance of sin. …nos redemisti in cruce. …to seek again a gem in putrefaction. …has redeemed us on the Cross. By divine power she was led to Him, and raised herself upward so that she was sprinkled by the blood from His side; and thus, by the will of the Heavenly Father, she was joined with Him in happy betrothal and nobly dowered with His body and blood. In the last two verses of the Symphony, Mary becomes the Queen of the “golden city” (aurea civitate)—an instant invocation of the Heavenly Jerusalem of which the Church is the archetype, as found also in the opening line of O Ierusalem, the sequence for St. Rupert that Hildegard likely composed for the dedication of her own abbey in 1152. The sequence is an extended meditation on the convergence of the heavenly city with the walls of her own abbey church, its stained-glass windows glittering with the city’s bejeweled colors, which gleamed too in the virtuous life of St. Rupert (Verse 2b: Nam tu, o nobilis Ruperte, in his sicut gemma fulsisti). Though newly professed virgins taking their marriage vows to Christ on the Rupertsberg might not be immediately familiar with that piece, it would certainly soon enter their repertoire, to reinforce the network of ties between their own virginal lives and eternal virginal life. The end effect of this network of images is to establish Hildegard and her virgin nuns as powerful heirs to the Virgin Mary and powerful participants in the Virgin Church. To be a Bride of Christ was also to reign as his Queen Consort. Although the temporal leaders of the Church were all male (her priests and prelates, bishops and popes), Hildegard subtly establishes a profound position of spiritual power for the women of her abbey. Though “in the world,” they live as brides of “the King of angels,” enthroned within their hearts (verses 3 and 8). With their mind fixed firmly on an eternal abode with him, he becomes “present even now” (verse 8), descending into the abbey like once he descended into the Virgin’s “palace” (in aulam, verse 9). Received within those sacred walls, the virgins who sang this Symphony experienced the first sweet taste of eternal life with their Bridegroom, the boundaries between earth and heaven dissolved with the entrance of Christ the New Song (see Ave generosa, verse 7). In both sources the piece moves away from E as a focal tone and then returns, either as E or as E transposed. Dendermonde: A below the final [E] to A an octave and a fourth above the final [E]. Riesenkodex: A below the final [E] to E an octave above the final [E]. O dulcissime amator is a most interesting work. There are significant differences between the sources that create some ambiguity as far as its modality is concerned. Because of the number of discrepancies, we have created two transcriptions, one representing the Dendermonde version (D) and the other the Riesenkodex (R). This was done to avoid having to make extensive use of ossia staves and annotations. In both sources, the symphony begins with a salutation. The first phrase, O dulcissime amator, is outlined by the modal final, E. The next phrase, o dulcissime amplexator, begins on G and ends on E, thus suggesting that it functions as the second clause of the salutatio. The next phrase, adiuva nos custodire virginitatem nostram, is a plea by the virgins to the Saviour to assist them in preserving their virginity. In D, the word adiuva (“help”) is capitalized, while it is lowercase in R. Thus it is not entirely clear if this phrase represents an independent verse, and the transcriptions differ according to the sources. In both manuscripts, the piece begins in the E mode, but the tonal shifts and divergences between the sources begin quite early. The phrase that commences with adiuva begins on the pitch G in D and on the pitch A in R, though it ends on E in both. The next verse, Nos sumus . . ., starts with the pitch C in both manuscripts. In D, the tonal focus begins to shift to G as a grammatical marker, but in R, the focus remains on C until the end of the verse, which finishes on the final E. This occurs on the last line of page one in both transcriptions. E remains dominant, with excursions to other pitch markers until page 3 of the transcriptions, with the phrase segment, repudiantes virum eligentes te, filium dei. In D, this text finishes on A, and the next verse (O pulcherrima forma . . .) commences on F. In R, repudiantes . . . begins and ends on G, while O pulcherrima forma . . . begins on E. From this point on, the sources diverge. In D, the melody moves into the A modality, and flats appear. In R, the movement is downward to C. While the D version continues in A and reaches higher into the range, in R, there is a return to E as an outlining pitch on page 4 of the transcription. Curiously, the R version of the pieces ends on the pitch D, while Dendermonde finishes on A. I am going to suggest that the D ending in R is an error, as the E modality predominates quite clearly after the downward transposition to C. Furthermore, there is no coherent relationship between R’s final pitch of D and the E modality that underlies the major structure. 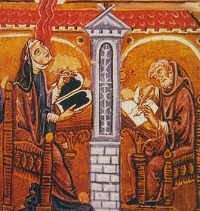 Because of the interesting tonal shifts in this symphony, I consulted with Dr. Sheila Mary Forrester, whose dissertation, “Hexachordal segmentation as analytical method applied to Hildegard von Bingen’s Symphonia,” (Florida State University, 2001), examines Hildegard’s songs from the perspective of hexachordal analysis. Unlike most Hildegard scholars, who focus on mode and modal transposition to explain some of Hildegard’s more unusual tonal/modal practices, she examines the tonal structures as hexachordal mutations. She believes that one possible explanation for the source differences is that there were indeed two versions of this piece. She also suggests that R might have been intended to accommodate a nun whose vocal range was more limited than that which would be required to perform the D version of this song. Both of these ideas are plausible, as the melodies in certain sections also differ. She also suggests that the B flats added in D be continued when the pitch B appears more than once on a single word, as it would be odd indeed for the melody to shift between natural and flat on the same word. These suggestions are added as notes in the transcription of the D version. In D, an interesting correlation can be observed between grammatical markers and range. The piece begins in the low register and remains there for the initial verses. As the governing pitch begins to move increasingly toward G and A in the last two pages of the transcription, the emphasis also starts to shift to the higher register. There is also a correlation between the register changes and the text. The opening theme has to do with the sorry state of humanity and reveals the struggle that holy women have with maintaining virginity and resisting temptation. As the lyrics move into the exaltation of the nuns’ holy marriage and their celestial bridegroom, the melody ascends into the higher register and mostly remains there until the end. In her edition (Hildegard von Bingen, Symphonia armonie celestium revelationum, Volume VI. Hildegard Publishing Company), Marianne Richert Pfau regularizes the mode and retains E as the primary modality. This results in transposing large segments and thus departing from the manuscript sources. Unlike our editions, which are intended as literal renditions of the sources, hers are intended for performance and thus would require editorial decisions. In this case, editorial changes would have to be substantial, as hers are, as there is no easy way to reconcile the different manuscript versions. To summarize, the widely variant versions of O dulcissime amator incorporate different modalities, ranges and melodies. In D, the E modality is transposed, after a series of tonal shifts, to A, on which it ends. The range of this version is considerably higher than in the R rendition. In R, the transposition is downward rather than upward as in D. Despite the tonal migrations, the E modality is mostly preserved, at least until the very end, with the anomalous final pitch D, which we have already concluded is probably an error. All of this is somewhat unusual for Hildegard’s songs. Modes are generally consistent, even in those that employ the non-standard A and C as finals, and the differences between the sources are not this dramatic. Hildegard of Bingen, Symphonia, ed. Barbara Newman (Cornell Univ. Press, 1988 / 1998), pp. 220-2 and 305-6.